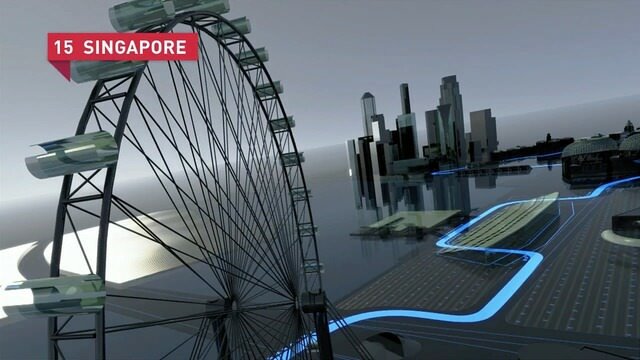 F1 is heading into deepest, darkest Singapore this weekend. Well, it will be dark at least, as it's time for Formula 1's only night race, and a fantastic blast through the city streets. As ever Mark Webber is on hand to guide us through the tight twists and turns of Marina Bay. The illuminated street circuit runs anti-clockwise and offers three potential passing points for the optimistic driver. But check out the concentration from Mark as he navigates the seemingly endless amount of corners Singapore has on offer, the final section notably being "full of chicanes". If there's passing to be done, the pits point to the more likely scenario. Red Bull are expecting their car to handle the undulating Marina Bay layout better than the flat out Monza circuit a fortnight ago. Despite finishing a lowly 6th in Italy, Webber currently sits atop the drivers championship and has to be a good bet a strong finish on Sunday.